Can you hear the crack of the bat? Can you smell the popcorn? Do you love baseball as much as we do here at RAVE Reviews? It’s spring, and that means it’s time to play ball. But baseball isn’t all about the big names and bright lights of the Major Leagues. It’s easy to forget there’s an entire farm system of Minor League Baseball teams all over the country. So if you’re looking to spend an afternoon (or 20!) 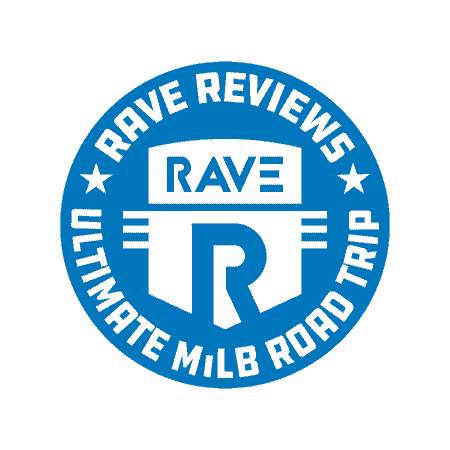 at the ballpark, do it a little bit differently this time with RAVE Reviews’ ultimate Minor League Baseball road trip. For many, baseball is woven into the fabric of everyday life. A big reason for that is the institution of Major League Baseball, which has been around for over 150 years. That’s a long time! And sure, maybe the NFL and NBA have recently gained ground in terms of popularity, but baseball remains the grand old game. It isn’t easy, however, for a lot of average baseball fans to enjoy an afternoon at a Major League ballpark — especially for an entire family. And that’s a shame, because how else will the love of the game get passed down to the next generation? Thing is, Major League stadiums aren’t the only places to enjoy the game of baseball. MLB’s Minor League system brings an affordable, accessible — but no less quality — brand of baseball to communities all over America. As we mentioned, Major League Baseball has been around for about 150 years. But exactly how long have people been playing the game? When and where did baseball originate? 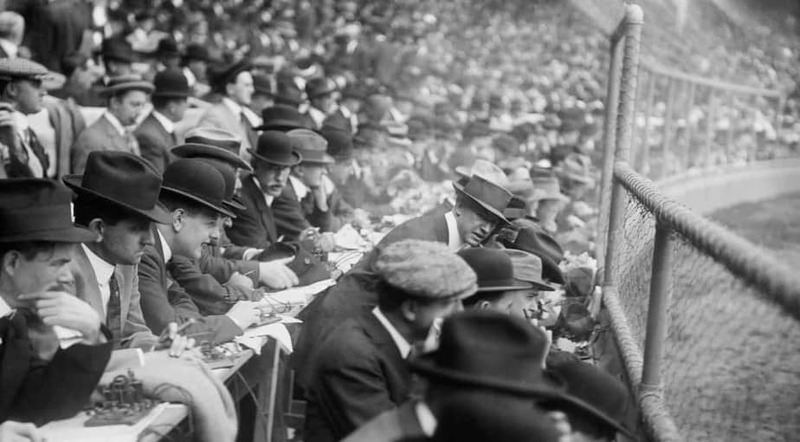 To answer these questions, we put together a brief history lesson on America’s pastime. The exact origins of baseball are unknown. Games similar to baseball, like cricket or rounders, had been played in England and across continental Europe for centuries. DID YOU KNOW: In an early form of the game, teams pitched to themselves, players ran the opposite direction around the bases from today’s game, and you could just chuck the ball at a player to get them out. One strange game that was sort of an early baseball/cricket hybrid was called dog and cat. In the game, a piece of wood called a cat was thrown at a hole in the ground while another player defended the hole with a stick, called a dog. Sometimes there were two holes and after hitting the cat, the batter would run between the holes. Fielders would try to get the runner out by getting the cat in the hole before the runner arrived. Bases that were holes in the ground — talk about an ankle-breaker for any runner that wasn’t paying attention! Early written references to baseball in North America come from the late 18th and early 19th century, though it’s likely some form of baseball was being played well before then. And Major League Baseball, America’s oldest professional sports league, was formed in 1869. Where did baseball first start? 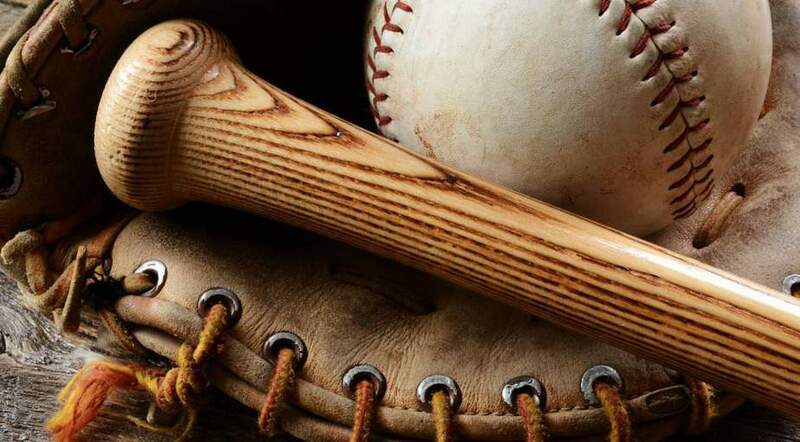 The exact origin of baseball as we know it today is the stuff of myth and legend. Think you know fact from fiction? Test your knowledge with RAVE Reviews’ early baseball quiz. True or false: Abner Doubleday officially invented the game in Cooperstown, NY in the summer of 1839. There is no record of Abner Doubleday ever having anything to do with the game of baseball. In fact, nobody knows exactly how Doubleday became associated with the game in the first place. Nevertheless, this baseball origin story is so persistent, it’s the reason that the Major League Baseball Hall of Fame is located in Cooperstown, NY. 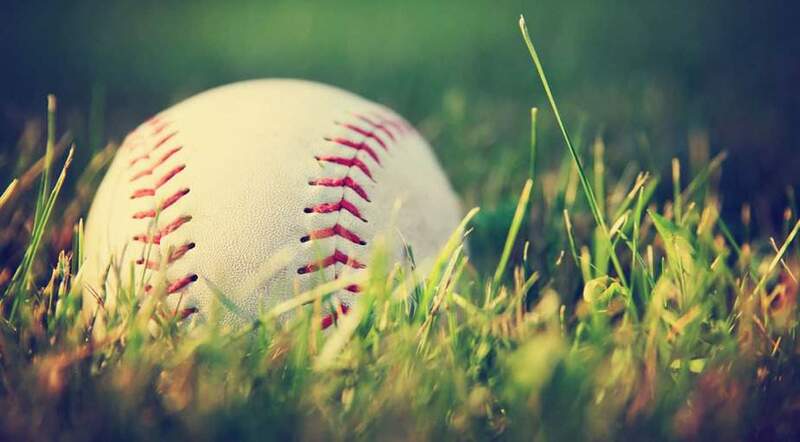 True or false: The first time baseball was played on a diamond was in New York around 1845. Prior to 1845, baseball was played with the rules of the “Massachusetts Game.” Instead of three bases arranged in the shape of a diamond, there were four bases arranged in a square. To score, the batter had to reach the fourth base instead of simply returning to home plate. In addition to the iconic baseball diamond in 1845, the New York Knickerbocker Baseball Club founder Alexander Joy Cartwright was also responsible for creating foul lines, establishing the three-strike rule, and abolishing the dangerous rule about getting a runner out by throwing the ball at them. That all sounds like the game we know and love today. Seems a little unfair Doubleday gets so much credit, doesn’t it? RAVE knows the only thing baseball fans love more than watching or playing baseball is talking about baseball. But we’re all through talking, so let’s waste no more time getting to our ultimate Minor League Baseball road trip! 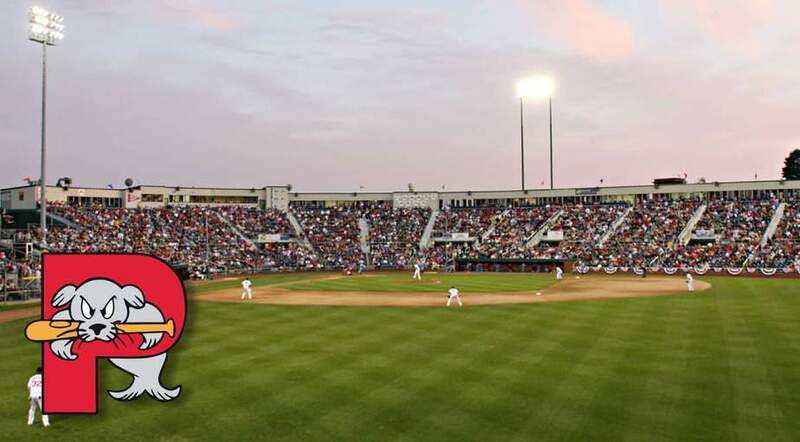 While planning our ultimate Minor League Baseball road trip, we sought out stops along the way that not only were home to great Minor League Baseball, but also made sense in the routing of our journey. So whether you’re just daydreaming of taking a trip like this, or whether you’ll actually try any portion of this trip, here’s the ultimate Minor League Baseball road trip. 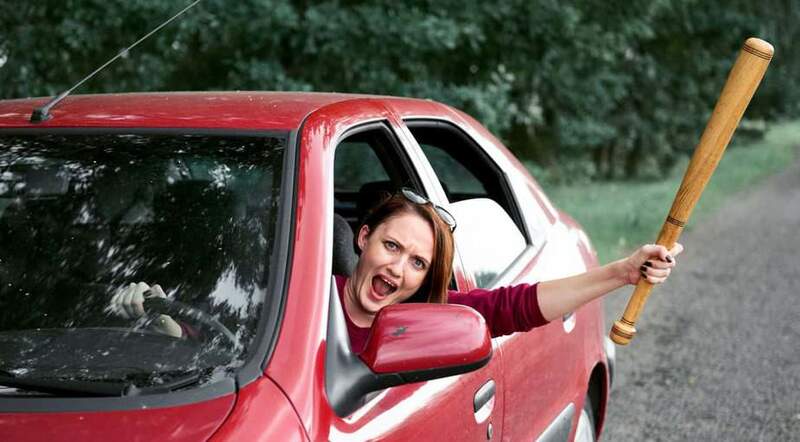 Roll down the windows on your car, get your big foam finger, and enjoy. We begin our ultimate Minor League Baseball road trip in the great Northwest. The Tacoma Rainiers are the Triple-A affiliate of the nearby Seattle Mariners. 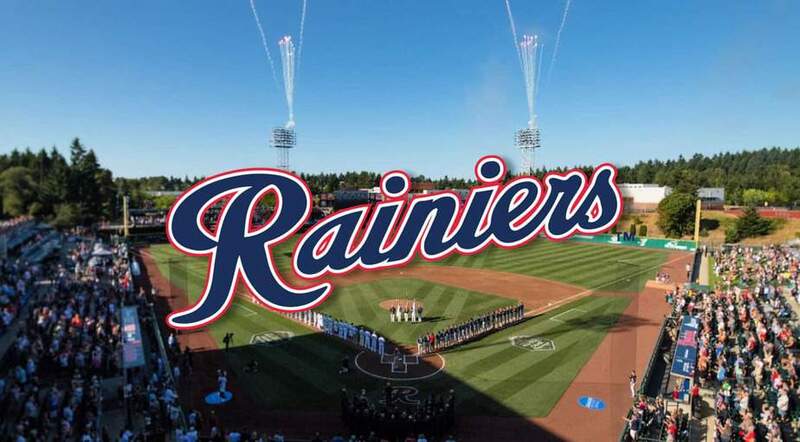 Fun fact: The Rainiers’ Cheney Stadium, opened in 1960, is less than 30 miles away from where the Mariners play, the shortest distance between a Triple-A team and their Major League affiliate. Over the years, the Rainiers have had a variety of mascots, including Tigers, Giants, Cubs, and Twins. The Rainiers play in the Pacific Coast League (PCL) and they’ve won the championship on 5 occasions: 1961, 1969, 1978, 2001, and most recently in 2010. The Tacoma area loves the Rainiers, with season-long attendance totals exceeding 300,000 fans in 25 separate seasons, including the last 15 seasons. The Rainiers ended the 2018 season a little down — 16 games out of first place. Nevertheless, their 2019 prospects look bright. Located squarely in the Puget Sound, the city of Tacoma offers plenty of things to do and see in addition to baseball. All this makes the Tacoma Rainiers an excellent first stop on our Ultimate Minor League Baseball road trip. The second stop on our ultimate Minor League Baseball road trip keeps us in the Northwest. 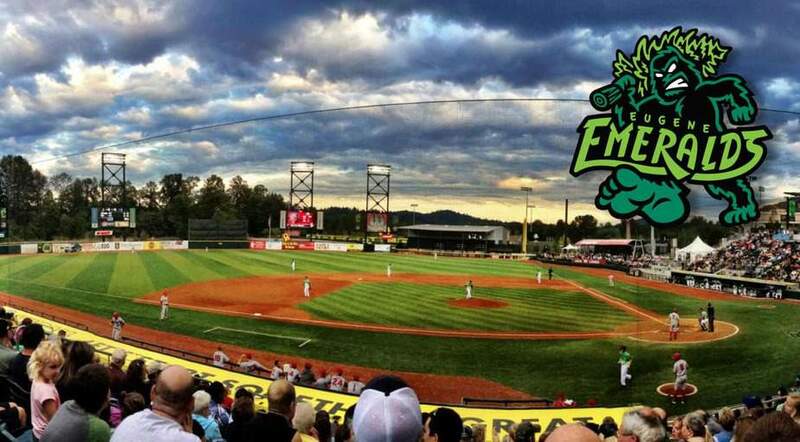 We’ll head south from Tacoma to Eugene, OR, home of the Eugene Emeralds, also known as the Ems. The Ems are a Single-A short-season affiliate of the Chicago Cubs. Founded in 1955 as a charter member of the Northwest League, the Ems once played at Eugene’s Civic Stadium. Civic was built in 1935 only to be lost to fire in 2015. Prior to that, in 2010, the Ems had relocated to PK Park, a stadium shared with the University of Oregon Ducks collegiate baseball team. The team has won four Northwest League titles, including two of the last four (2016 and 2018). Notable Ems alumni include second baseman and outfielder Ian Happ and MLB all-star pitcher Kevin Appier. Fun fact: The Eugene Emeralds were named in a contest won by an 11-year-old boy. From Eugene, head due south to Sacramento, where the Sacramento River Cats play. Also in the Pacific Coast League, the River Cats are an affiliate of the San Francisco Giants. The River Cats play in Raley Field, opened in 2010. The team was once known as the Sacramento Solons. Founded in 1903, they were a charter member of the PCL. This makes Sacramento the only PCL charter city to still host a team. All this means there’s a lot of baseball tradition in Sacramento! And Sacramento loves their River Cats. In 2015, the team drew 672,354 fans in 72 home games, leading the Minor Leagues in total attendance. The River Cats have won four PCL championships, including back-to-back wins in 2007 and 2008. The team went on to win the Triple-A National Championship Game in both those seasons. 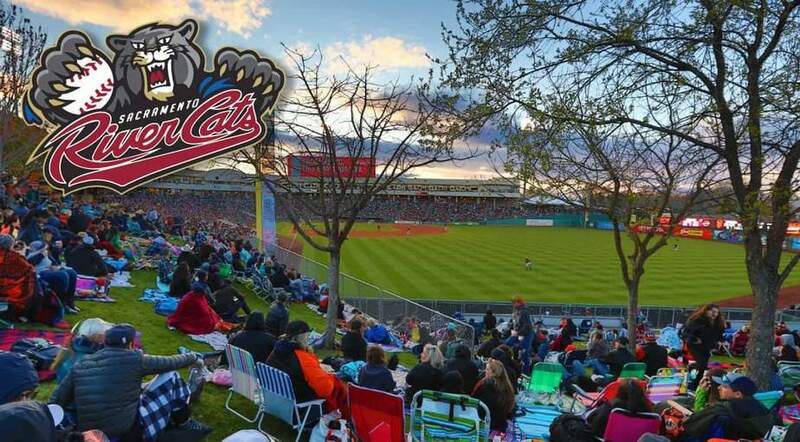 In 2016, Forbes listed the River Cats as Minor League Baseball’s most valuable franchise at an estimated $49 million. The fourth stop on our ultimate Minor League Baseball road trip is Colorado Springs, CO, where the newest team on our itinerary, the Rocky Mountain Vibes, plays at Security Service Field. Colorado Springs has had a Minor League team for a while. But in 2018, it was announced the Triple-A Colorado Springs Sky Sox would relocate. 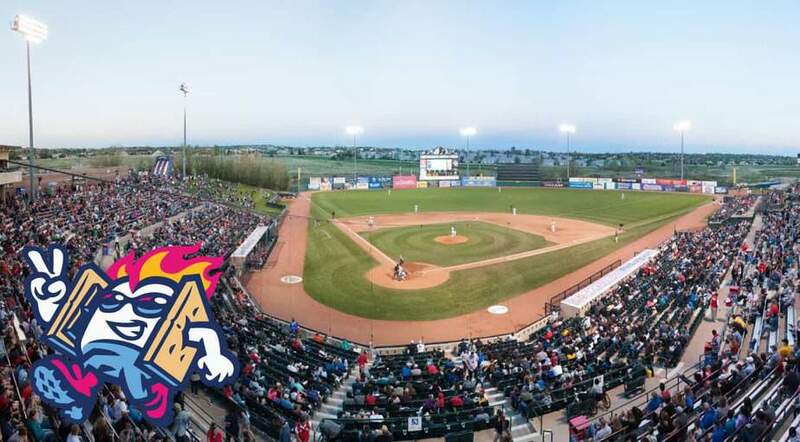 But the following year, the Helena Brewers announced that they would relocate to Colorado Springs, becoming the Rocky Mountain Vibes and playing as a rookie affiliate of the Milwaukee Brewers in the Pioneer League. Security Service Field was built in 1988 and holds about 8,500 fans. Since 2019 will be the Vibes’ first year, they’ve yet to win any titles (the Helena Brewers won six). Will you see the next Brewers star, like Christian Yelich, when you watch a game at Security Service Field? From Colorado Springs, continue southeast to the Lone Star State. 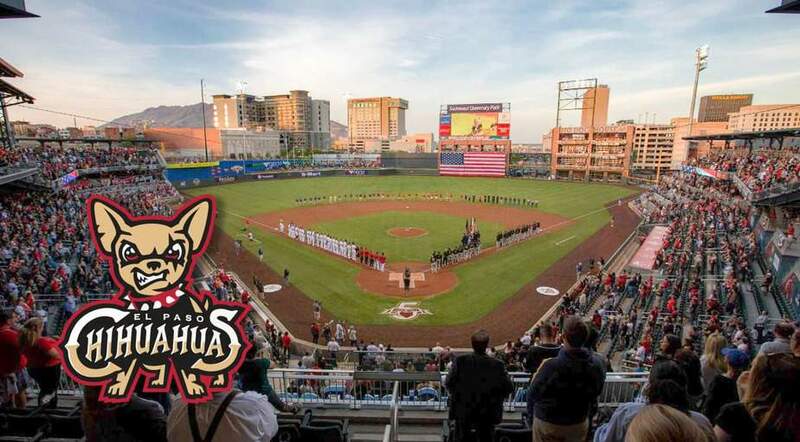 Don’t stop `til you get to El Paso, where the El Paso Chihuahuas play at Southwest University Park. Also part of the Pacific Coast League, the Chihuahuas are the Triple-A affiliate of the San Diego Padres. The Chihuahuas (formerly the Tucson Padres) have only been in El Paso since 2013, but they already have a league title to their credit (2016). In 2018, El Paso won their division. Interestingly, the El Paso Chihuahuas began as the Los Angeles Angels (no relation to the current Los Angeles Angels of Anaheim), a founding team in the PCL. Over the years, the team moved around a lot, including stints in Albuquerque, NM and Portland, OR before eventually landing in El Paso. Notable players to come through the Chihuahuas include outfielder Jeff Francouer, who played with the Mets and Phillies among other MLB teams, and outfielder BJ Upton, who played with the Braves and Blue Jays in addition to many other teams. From El Paso, turn northeast toward your next stop. The Northwest Arkansas Naturals play in Arvest Ballpark, which holds about 7,800 people and was completed in 2008. That same year, the Naturals relocated from Wichita, KS, where the team was known as the Wichita Wranglers. The Naturals are a Double-A affiliate of the Kansas City Royals. The team got off to a hot start in their new home of Springdale, advancing to the playoffs in both 2009 and 2010. In 2009, the Naturals won the North Division title, only to lose in the Texas League Championship Series. But in 2010, the Naturals would sweep the first and second half titles. The Naturals then went on to win the Texas League title in a 3-1 series victory. In 2018, the team finished .500, but their 2019 prospects look strong. So don’t sleep on the Naturals! Only one Naturals player has gone on to the Major Leagues: pitcher Jeff Fulchino, who threw a scoreless inning in relief during a 6-3 Royals loss at Yankee Stadium. 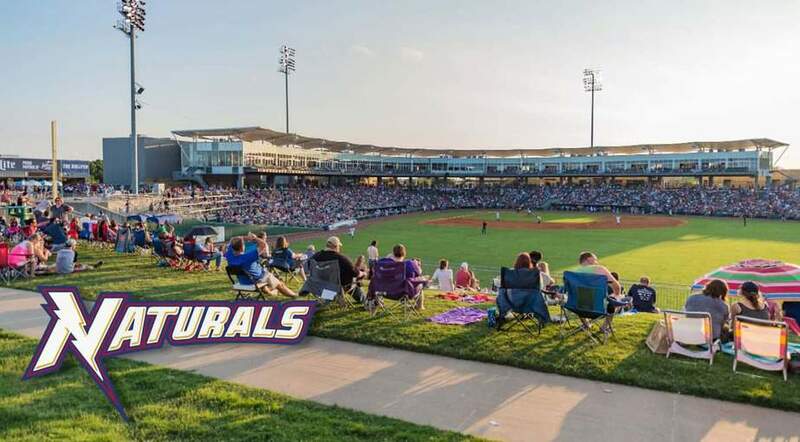 But considering the team’s trajectory over the last few years, you’re bound to see an up-and-coming MLB star when you watch a Naturals game in Springdale! The next stop on our ultimate Minor League Baseball road trip takes us to the Midwest — Omaha, NE, to be exact. 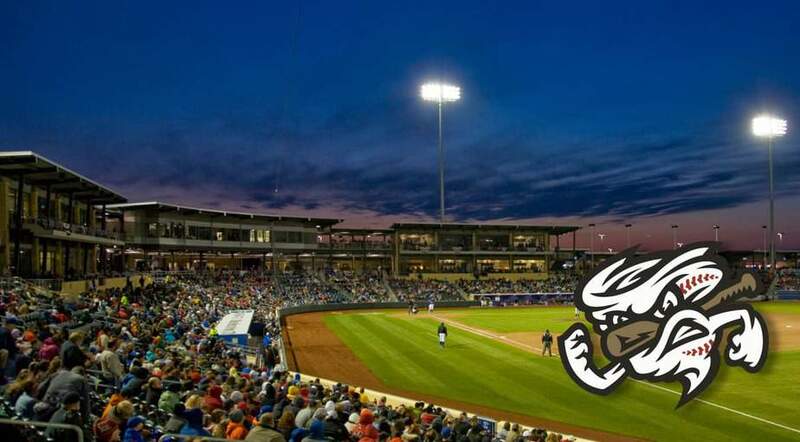 The PCL’s Omaha Storm Chasers play in Werner Park, located in Papillion, a northwest suburb of Omaha. The Storm Chasers are a Triple-A affiliate of the Kansas City Royals. They’ve been the Royals’ only Triple-A affiliate since the Kansas City team’s inception back in 1969. So the Storm Chasers have been around a while, and they have the championships to prove it. In 2013 and 2014, the Storm Chasers won back-to-back PCL championships, having previously won the PCL title in 2011. They went on to win the Triple-A National Championship Game in 2013 and 2014. They also won the American Association championship in 1969, 1970, 1978, and 1990. In 2018, they finished third in their division, but they’re looking to rebound in 2018. Notable players to come through the Storm Chasers include George Brett and Luis Mendoza. Staying in the heartland, Des Moines is our next stop. 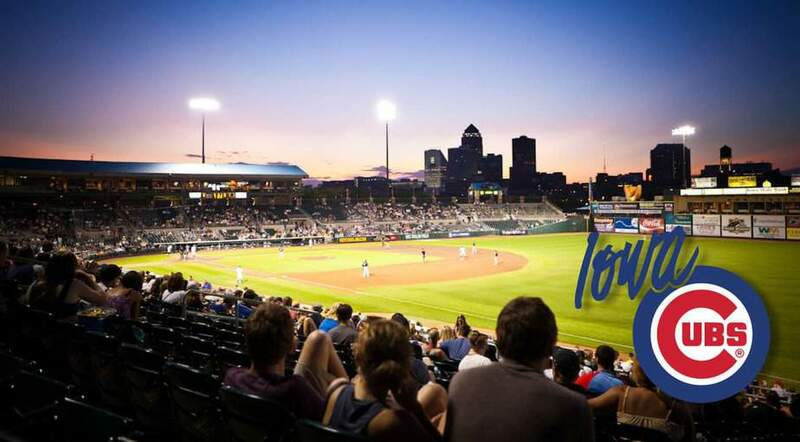 Des Moines is home to the Iowa Cubs, fittingly enough the Triple-A affiliate of the Chicago Cubs. The Iowa Cubs joined the PCL in 1998, and they play in Principal Park, built in 2004. Their only league title came prior to joining the PCL. In 1993, they won the title in the American Association. But teams named the Cubs are known for long droughts, after all — so don’t lose hope! And if you’re a fan of those other Cubs, you’ll love to watch their Des Moines affiliate. Over the years, tons of Cubs stars have passed through the organization, including Mark Grace, Carlos Zambrano, and Cary Wood. Will any of the Iowa Cubs 2019 Major League prospects become a Chicago Cubs star of the future? From Des Moines, turn due west to reach Geneva, IL, the seventh stop on our road trip. Great Minor League Baseball happens on all levels of the system — from Single-A to Triple-A. The Kane County Cougars are the Single-A affiliate to the Arizona Diamondbacks. They’re in the Midwest League and they play at Northwest Medicine Field, just 35 miles west of Chicago. The Cougars hold the distinction of being among their league leaders in attendance, and in 2013, the Cougars became the first Class A team to attract 10 million fans. In 2018, the Cougars finished fourth in their division with a record of 72 and 66, eight games out of first place. The Cougars have won the Midwest League championship four times, most recently in 2014 when they swept Lake County in the finals. Notable players that have passed through Geneva, IL include relief pitcher Huston Street, World Series-winning starting pitcher Josh Beckett, and the unconventional pitcher Dontrelle Willis. 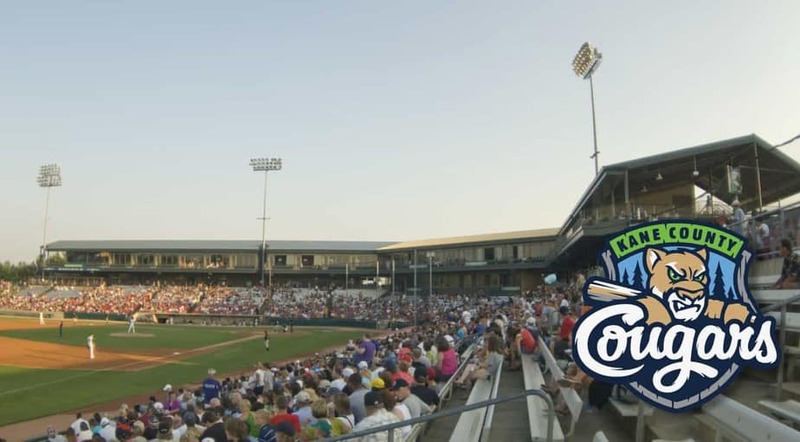 After Geneva, IL, set your course to Columbus, OH, where the Columbus Clippers play ball as the Triple-A affiliate of the Cleveland Indians. In 1992, the Clippers were recognized as one of the National Baseball Association’s top 100 minor league teams. 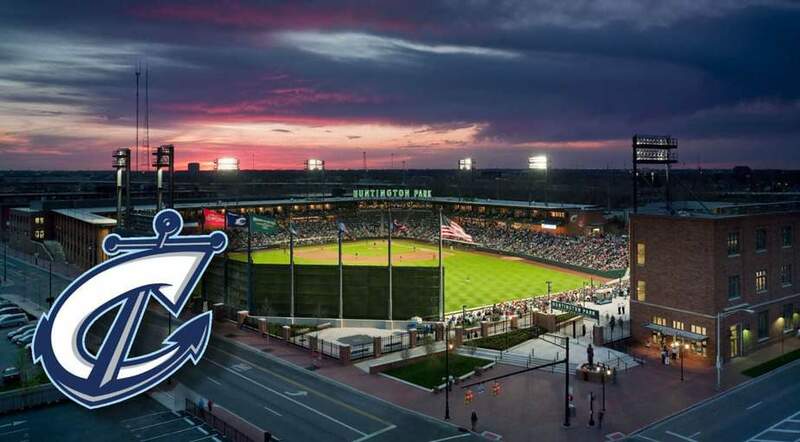 In 2009, the Clippers began playing at Huntington Park in Columbus’ “Arena District.” The team formerly played at Cooper Stadium, and in 2008, over 16,000 people watched the final game at this beloved ballpark. So there’s lots of love in Columbus for the Clippers, which makes for a great atmosphere for baseball. In 2011 and 2012, the Clippers won back-to-back Governors’ Cup championships, and in 2011, the team went on to win the Triple-A Baseball National Championship Game. Notable Clipper alumni include catcher Brad Ausmus and legendary first baseman, coach, and manager Don Mattingly. From Columbus, set your coordinates for Harrisburg, PA, home of the Harrisburg Senators, a Double-A affiliate of the Washington Nationals. The Senators play at FNB Field, which opened in 1987 and was renovated in 2008. The stadium holds over 6,000 people. The Senators have won a whopping nine (nine!) Eastern League titles, though it’s been a while. Their last championship came all the way back in 1999 (which means they’re due!). The 1993 Senators were recognized as one of the 100 greatest minor league teams of all time. In addition to being the current home of the Senators, Harrisburg has a long history with professional baseball. The Harrisburg Base Ball Association was formed back in 1884, and in 1901, the first baseball club in Harrisburg was created. By 1912, Harrisburg won the first of three consecutive Tri-State Association championships. Notable former Senators include right fielder and DH Vladimir Guerrero and current MLB mega-star Bryce Harper. 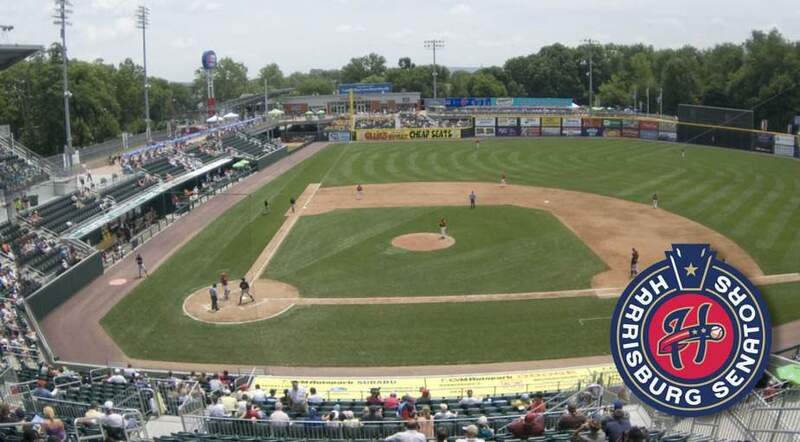 What future MLB star will you see play in Harrisburg? 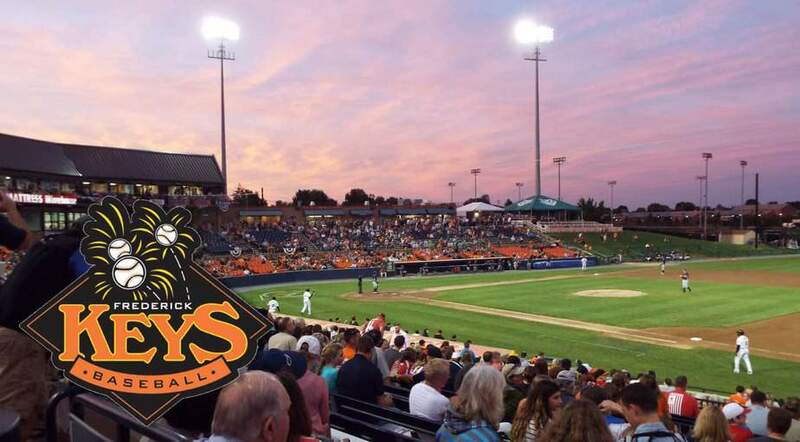 The 10th stop on our road trip is Frederick, MD, home to the Frederick Keys, the first of several great places to see Minor League Baseball along the Eastern Seaboard. 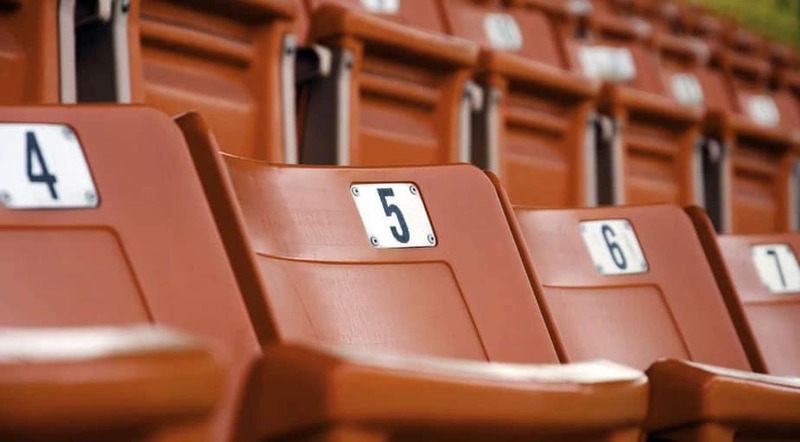 They’re an Advanced Single-A affiliate of the Baltimore Orioles, and they play their home games at Nymeo Field at Harry Grove Stadium, which seats about 5,400 spectators. The Keys last won a championship in 2011, one of three championships won by the organization. And like a lot of stops along the way, Frederick, MD and baseball go way back. Frederick was a founding member of the Blue Ridge League, which existed from 1915 to 1930. Frederick has been sending players to the Major Leagues since all the way back in 1915. Some recent MLB players to come through Frederick include Mets utility player Ty Kelly and White Sox third baseman Nicky Delmonico. 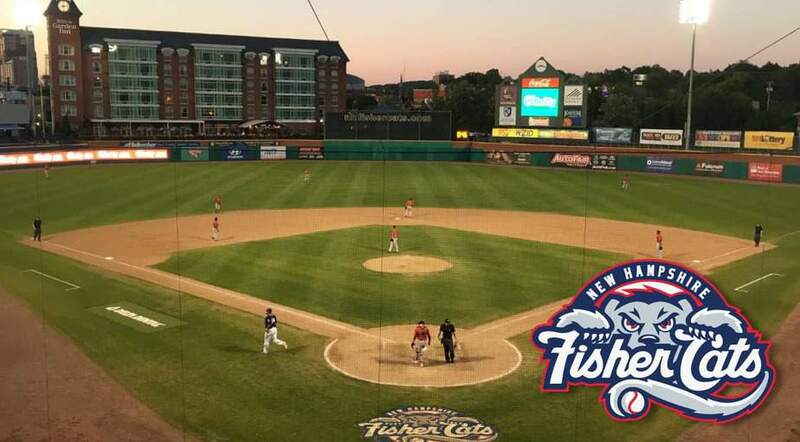 Next, head to Manchester, NH where the New Hampshire Fisher Cats play as the Double-A affiliate of the Toronto Blue Jays. The Fisher Cats play in the Eastern League at Northeast Delta Dental Stadium, with a capacity of 6,500. The Fisher Cats won a championship in their very first season in New Hampshire after relocating from New Haven, CT in 2004. The team has since gone on to win four league titles, and three division titles. In 2018, the Fisher Cats won the Eastern League championship. A bit of Fisher Cats trivia: In 2004, the team’s name was almost changed to the New Hampshire Primaries (get it?!). Ownership unveiled a logo with an elephant and donkey holding baseball bats. But the public didn’t like the political connotation of the team name, so the Primaries were scrapped and the Fisher Cats were born. Notable Fisher Cat alumni include pitcher Danny Farquhar. Our next stop brings us to Portland, ME. Portland’s Minor League team, the Sea Dogs, is the Double-A affiliate of the Boston Red Sox. Part of the Eastern League, the Sea Dogs play at Hadlock Stadium with a capacity of just a little over 7,300. The team’s one and only championship title came in 2006, though they made the Eastern League Championship series both of the first two years the team played in Portland. In 2018, the Sea Dogs came in last in their division. But with some great Red Sox prospects, the team looks strong for the 2019 season. Former Sea Dogs now in the Major Leagues include one-time MLB outfielder and current manager of the Chicago White Sox Rick Renteria. NFL coach Bill Parcells as well as former President George H.W. Bush have been spotted at Hadlock Stadium — so you never know just who you might see enjoying a little Sea Dogs baseball! 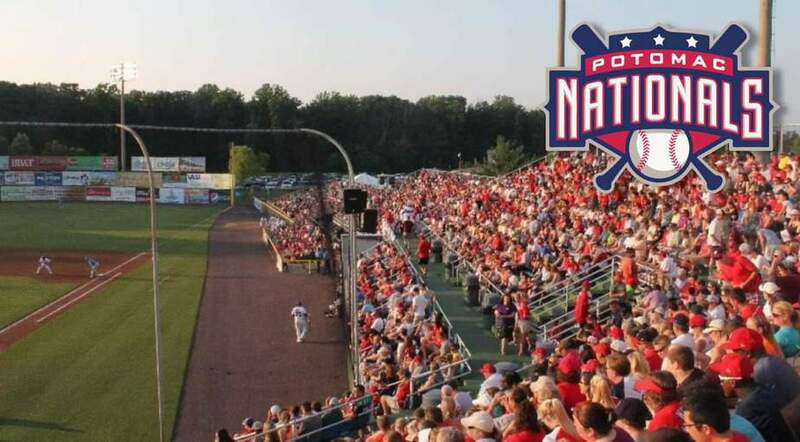 Turning south from Portland brings us to Woodbridge, VA.
Part of the Carolina League, the Potomac Nationals are a Class A-Advanced affiliate of the Washington Nationals. The team plays on Northwest Federal Field at Pfitzner Stadium, which opened in 1984 and holds 6,000 people. The team has won an impressive nine division titles and four league titles, the last coming in 2014. Notable MLB players who played in Woodbridge early in their careers include outfielder Mike Cameron and the inimitable hitter Albert Pujols. If you want to catch the Nationals in Woodbridge, however, you better act fast. The team has plans to move to Fredericksburg, VA for the 2020 season. But for now, Woodbridge is a great place to scout some future stars of those other Nationals. The Southern leg of our road trip takes us to Kinston, NC. 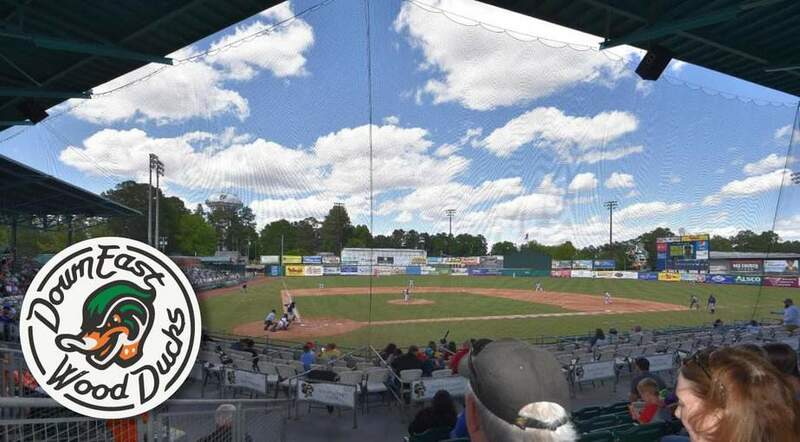 In Kinston, the Down East Wood Ducks play in the Carolina League as a Class A-Advanced affiliate of the Texas Rangers. The team plays home games at the historic Grainger Stadium, built in 1949 and able to host a little over 4,000 spectators. There’s a long history of minor league baseball in Kinston. Since 1908, the town has hosted 11 minor league teams! In 2018, the Down East Wood Ducks were named co-champions of the Carolina League along with the Lynchburg Hellcats — the playoffs were called off because of Hurricane Irma. The previous year, Ballpark Digest awarded the Down East Wood Ducks the title of best logo/branding for Minor League Baseball — so be sure to pick up a jersey while you’re there! 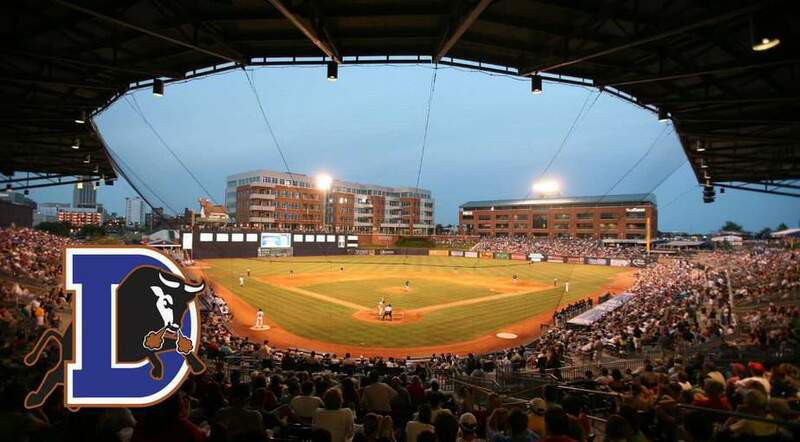 Staying in North Carolina, we’ll head next to Durham, where the Durham Bulls play in the International League as the Triple-A affiliate of the Tampa Bay Rays. There’s been Minor League ball in Durham since 1902, when the Durham Bulls began life as the Durham Tobacconists. The Durham Bulls gained prominence after the release of the highly successful Kevin Costner film Bull Durham. They might be one of the most recognized Minor League franchises, not only in America but around the world. Over the years, the Durham Bulls have won over 30 league, class, and division titles, the most recent being in 2018.
Notable Bulls alumni include MLB second baseman and famous baseball broadcaster Joe Morgan, as well as third baseman Chipper Jones. And one of the most well-known MLB players in history, Jackie Robinson, played infield for the Durham Bulls. 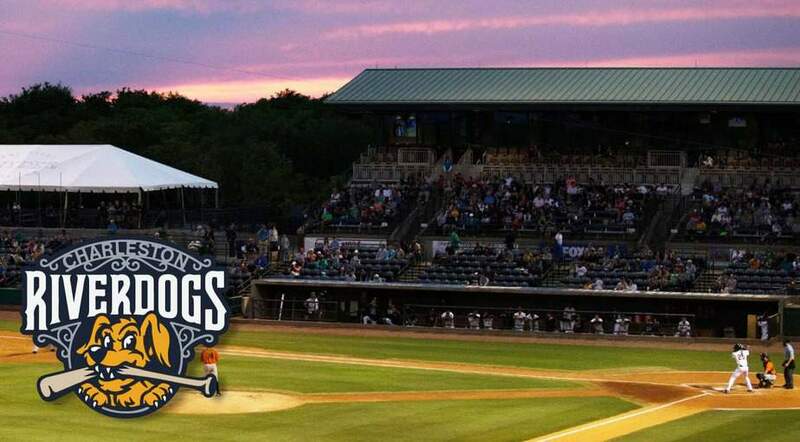 From Durham, head south to Charleston, where the Charleston RiverDogs play Single-A ball in the South Atlantic League as an affiliate of the New York Yankees. The RiverDogs play home games at Joseph P. Riley, Jr. Park, which accommodates about 6,000 baseball fans. The team has never won a league title, but it has scored five division titles, most recently in 2008. Well-known RiverDogs that went on to the Major Leagues include second baseman Roberto Alomar and pitcher Ryan Dempster. Although the team hasn’t yet clinched a league title, hope springs eternal for the RiverDogs. Will 2019 be their year? Plan a trip to Charleston and find out. 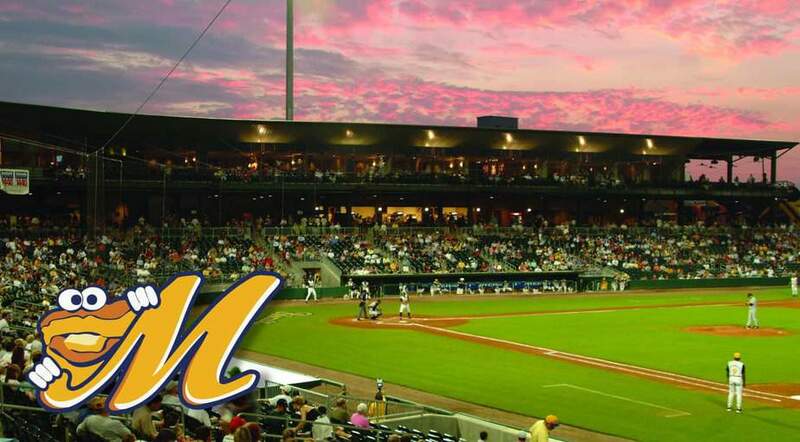 The next stop on our ultimate Minor League Baseball road trip brings us to Montgomery, AL, home to the Montgomery Biscuits. The Biscuits are the Double-A affiliate of the Tampa Bay Rays, playing in the Southern League. They play in Montgomery’s Riverwalk Stadium, which has room for about 7,000 fans. The stadium was built specifically for the team from a converted century-old train shed, making Riverwalk Stadium a landmark destination in all of Minor League Baseball. In 2006 and 2007, the Biscuits won back-to-back league titles. Players who spent time in Montgomery include infielder Nick Solak and outfielder Ryan Boldt. 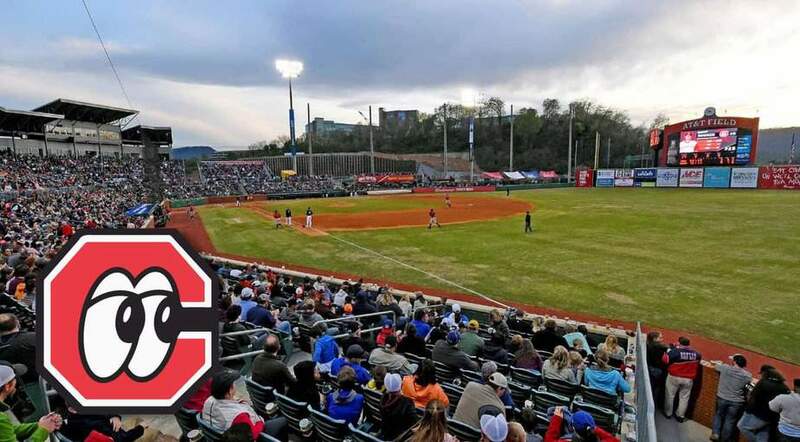 The last stop on our ultimate Minor League Baseball road trip is Chattanooga, TN, where the Chattanooga Lookouts play in the Southern League as a Double-A affiliate of the Cincinnati Reds. The team plays at AT&T Field, which accommodates about 6,300 fans. Since 1932, the Lookouts have won 13 league, pennant, and division titles. Their latest division title was in 2017. A bit of baseball history was made in 1931, when the New York Yankees played an exhibition game against the team. A female pitcher for the Lookouts named Jackie Mitchell — one of the first female pitchers in professional baseball history — struck out Yankee greats Lou Gehrig and Babe Ruth.